One of the most commonly asked questions at Studio Poise would have to be, "What shoes should I wear for this class?" To help figure out your footwear dilemmas once and for all, we turned to Danielle herself to settle the score! Veterans of our 6 Weeks to Chic program will tell you that the #1 rule is to banish the scale. Read on to learn why the scale can actually do more harm than good, and to better understand why measurements matter. When we sit down together for the Six Weeks to Chic kick off meeting, one of the first rules is to banish your scale. Have you ever wondered why Danielle and the other instructresses emphasize that the scale isn't a useful tool in measuring your fitness progress? The scale only gives a very small view of your overall health and fitness. Your weight is only a number, but the scale doesn't tell you the body composition that leads to that number. The classes at Studio Poise are designed to help you reduce body fat and build lean muscle. Muscle takes up significantly less space than fat. As you work on toning your body and creating the long, lean muscles that we strive for in Poise method classes, the number on the scale may not change much - and that's okay. If you're relying solely on the scale to measure your progress, though, you may be tempted to feel discouraged and give up on your efforts. Well, we're here to tell you: DON'T GIVE UP! The scale isn't telling the whole story. Measurements are the most effective tool for seeing your progress. We take measurements at the beginning, midpoint, and end of the Six Weeks to Chic program to get a thorough understanding of the progress made during the program. These measurements can help you to understand what's working well, and what areas you may need to focus on improving. To make sure you get the most out of your measurements, we recommend that you have someone else handle the measuring tape. It's extremely difficult to measure yourself accurately, so ask a friend to help! It's also key that you have the same person measure you consistently. At Studio Poise, the instructresses who assist with 6 Weeks to Chic have all been trained to ensure that measurements are consistent across the duration of the program. You need to make sure that you're measuring in the same spot every time, and that the measuring tape is held with the right amount of tension. If you hold the tape too loosely, or if you hold it too tightly, you aren't getting an accurate picture of your progress. The measuring tape should lay flush against your skin, without too much slack or tension. We recommend measuring yourself regularly - about once every 3-4 weeks. Keep track of your progress, either in a notebook or in a tool like MyFitnessPal. Celebrate where you're toning effectively, and ramp up your intensity on the areas that are slower to change. The instructress team at Studio Poise is always ready, willing and able to answer any questions you might have about how to focus in on specific body parts! Don't forget - there's one week left to register for our Fall 2015 Six Weeks to Chic program! See the comments on this post for detailed instructions on how to register for this amazing package. Don't believe us? Maybe a few Transformation Stories will help to convince you! Lauren, Michelle and Sarah all had great results with 6W2C - click their names to see their results! The summer months are ideal for taking your fitness routine outside! The beautiful weather begs us to get out and get moving. But the sun and higher temperatures require some additional planning to keep you safe - read on for some strategies to ensure that your outdoor workout isn't harming you! We know that #poisenation loves a great pair of black leggings, but dark colors absorb heat and can be unbearable when you're getting your sweat on in the great outdoors. Instead, look for light-colored workout gear in moisture-wicking fabrics. These will help you to feel cooler when you're working hard. Wear sunblock - and reapply! Sunblock is an essential accessory for outdoor fitness. Look for water-resistant formulas of at least SPF 30 - ones that say "sport" on the label are a good bet. Apply your sunblock at home, before you get dressed. Clothing can shift during your workout, so by applying your sunblock first, you ensure that you don't end up with a sunburn line from where your bra strap shifted during downward dog! If you're going to be working out for more than an hour outside, bring along the bottle of sunblock so you can reapply. Most formulas are only guaranteed for 80 minutes of activity, and sweat can break down the sunblock faster, reducing its effectiveness. Thursday, July 9, 6:30pm: Pick Your Poise*N with Alison on the green at Market Street; hosted by Lululemon Market Street. RSVP here! FREE! Thursday, July 23, 6:30pm: Poise with Danielle on the Green at Market Street; hosted by Lululemon Market Street. RSVP here! Free! Last month, the blog featured a post on avoiding hidden sugars. It's just as important, however, to watch out for artificial sweeteners - chemical additives that provide sweet flavor without caloric impact. Today, we're taking a look at these artificial sweeteners! When you begin making changes to your diet, your inclination might be to find alternatives to your normal comfort foods. Hooked on soda? You might find yourself reaching for diet versions instead. Can't live without sugar in your coffee? You'll reach for the Equal instead. But are these alternatives really "healthier," or are they just the lesser of two evils? As it turns out, diet soda, and other drinks with artificial sweeteners, have a whole host of negative side effects. A study out of the University of Texas Health Center at San Antonio found that study participants who drank diet soda were more likely to gain weight than to lose it. The study found that the artificial sweeteners in diet soda caused the metabolic signals in the body to malfunction, and put users at a higher risk for obesity. A 2013 study out of Purdue University, published in Trends in Endocrinology & Metabolism [author manuscript full text available here, through PubMed Central], provides an overview of research that demonstrates a link between the consumption of artificially sweetened beverages and obesity, type 2 diabetes, cardiac disease, high blood pressure, and metabolic syndrome. What does all that research mean? Basically, the sweet flavor from these chemical additives tricks your brain into craving more sugar. Your body also reacts to the artificial sweeteners in the same way as it does to real sugar, so you can actually be counteracting all of your healthy habits by adding that pink packet to your daily coffee. So, what's a girl to do? Luckily, we have some tips on refreshing drinks that can help to fill the soda void in your life! Soda water, seltzer, club soda - they all basically mean the same thing, water with carbonation added. There are a number of brands that offer flavored soda waters that don't have any added sweeteners. Polar Beverages is based here in Massachusetts, and they offer great seasonal options, like Blueberry Lemonade or Pomegranate Sangria. However, make sure to read the label before you buy! You want to find a brand that only adds flavoring; check for added sweeteners to avoid an unpleasant surprise. Also, this shouldn't replace the regular H2O you're consuming throughout the day! Too much carbonation can lead to bloating, so treat this as just that - a treat. Green tea is a great alternative to coffee. It has a whole range of benefits that can help to improve your efforts at living a healthier lifestyle, and it tastes great! If you don't enjoy the flavor of green tea on its own, try adding a squeeze of fresh lemon or lime juice, or add a few pieces of frozen fruit - frozen raspberries or peach slices are my favorite options! You can also find great tea blends that include fruit flavors; Whole Foods has an extensive selection to explore! Word of caution: Caffeine can be dehydrating, so make sure that you're drinking water alongside your iced tea. Any graduate of the Six Weeks to Chic program knows that drinking water continuously throughout the day is a huge factor in improving overall health. However, plain old water can definitely get boring at times. Infusing your water with natural flavors can help to add interest to your daily water intake, and as long as you choose the right additions, you won't be negating your efforts at the studio. Pitchers and water bottles with infusers are easy to find these days - try this model as an example. Some of our favorite combinations here at SP include strawberry & basil, cucumber & mint, grapefruit & lemon slices, or mixed berry. What are your favorite healthy beverage options? Any tips for breaking the artificial sweetener habit? Let us know in the comments! Knowing how to read food labels is essential to successfully changing your eating habits. Ultimately, the healthiest eating habits avoid packaged and processed foods as much as possible, but practically speaking, processed foods will likely make their way into your grocery carts. To ensure that these foods don't sabotage your healthy living efforts, it's important to know how to read labels! Sugars are one of the sneakiest ingredients. Foods marketed as "low fat" usually contain added sugars to help with flavoring, and sugar helps to extend the shelf life of packaged foods. It's important to limit your sugar intake wherever possible, and to aim for naturally occurring sugars when you do consume them - such as the sugars found in fruits or starchy vegetables. Look out for "-ose" words - these are usually sugars! Terms like "glucose," "fructose," and "maltose" are all just different words for sugars. If you see a word ending in "-ose" in the ingredients list, chances are sugar has been added to the food. "Natural" sugars are still sugars! It's easy to be tricked into thinking that there are "healthy" versions of sugars. A huge amount of money goes into marketing for packaged foods. Things like agave nectar, evaporated cane juice, and date sugar might sound like healthier ways to sweeten your foods, but they're still considered sugars and they'll have the same effect on your diet as plain old table sugar. "Low/Reduced Sugar" is not formally defined by the FDA. If you see claims of "Reduced sugar" on packages, approach with caution. The FDA does not define what constitutes "low sugar," because the term is in relation to the "standard" version of the same food. So sure, maybe those Oreos have less sugar than their regular counterparts...but they still contain sugar and will still have an impact on your health goals! Artificial sweeteners are not the answer! 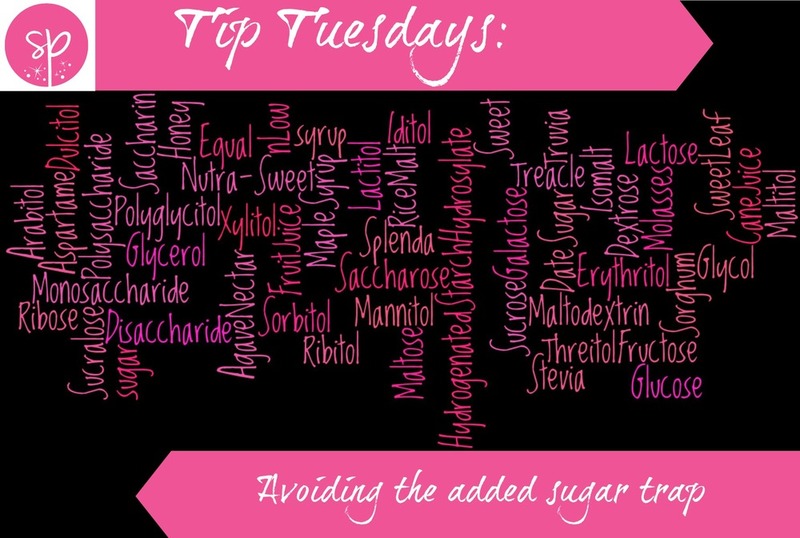 We'll have more on this in a future "Tip Tuesday" post, but be wary of adding artificial sweeteners like aspartame, splenda, or sucralose. While they may not have the same caloric impact of real sugar, artificial sweeteners can make you crave more sweet foods, undermining your efforts to choose healthier options. Interested in reading more about sugars in your foods? The following links were used in researching this post and contain more helpful information!